Branded duffel bags provide a super low-cost way to promote your brand and provide your clients with a really useful product that will last. Duffel bags can be used for a wide variety of purposes including carrying clothing, footwear and other items and appeal to a wide demographic. Our duffle bag range offers several options including size, features and colours and imprint methods including screen printing and embroidery. We are only a phone call away on 0800 158 3080 if you need more assistance or help in sourcing the right bag for your promotion or even a custom designed bag. Branded duffel bags are generally cylindrical canvas bags with a logo imprint and drawstring which is used to close and carry them over a shoulder. Duffel bags have several uses and are very convenient for carrying clothing and other items when travelling. They generally offer plenty of storage room and can be folded down when not in use for convenience. Duffel bags also offer a great branding area for a logo imprint. Where Did The Term ‘Duffel’ Originate? People have always need to carry items with them whether its food and provisions, clothing and footwear, tools or documents. 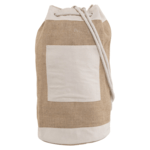 The earliest carry bags were sacks, which could most likely have been re-used grain sacks or pieces of rough blanket sewn into a sack like structure that could hold goods and be easily carried over a shoulder or even tied to a stick. Duffle bags were an extension of the sack concept and provide a low-cost and convenient way to pack and carry goods. The name comes from the town of ‘Duffle’ in Flanders, Belgium where the thick cloth used to make the bag originated in the 17th century. The word dates back to 1677 and describes the thick material used to make the bag: a coarse woollen cloth or canvas. The Duffle material was exported to neighbouring countries including Spain and Portugal where it would be sued to repair sails and used to make sea bags which were the early forerunner of the duffle bag that we know today. The term duffel is more often associated with ‘kit bags’ and is the main type of bag used by many people within the armed forces. Duffel bags were commonly used by the military during World War II due to their durability and ease of use. The bags were used to carry supplies, medicines, tools, equipment and weaponry and were affectionately named ‘doughboys’ due to their shape. Following their widespread usage during the war, the bags could be found within many countries and regions including the United States, Europe, Middle East and Africa and Asia-Pacific regions. The bags, being low cost to manufacture and highly durable became very popular and started to pick up their own following as fashionable items for people to have amongst certain segments including surfers and other sports people. Today, the term ‘duffle bag’ applies to a wider format of bags and the bag has evolved into an ‘in vogue’ item for several different demographic groups whether this is sports people, students or travellers. In addition, whilst the traditional shape is a cylinder made from canvas with a rope tie through eyelets, more modern ‘duffles’ include squarer designs and made from leather or PU (imitation leather) materials. The bags are also available in a wide range of sizes and formats. Today’s bag manufacturers offer a range of duffle bags including the traditional military looking types. There are now options including internal and outer pockets, wheels for easy transportation and carry handles. Promotional duffle bags are also available in a wide range of sizes, colours and materials. Another term for this type of bag is ‘gym bag’ and this often leads to thoughts about what other promotional merchandise can be used in conjunction with this item. Gym bags are soft material bags that people sometimes use to take their workout clothing and gadgets to a gym in. What goes inside can include: headphones, clothing, underwear, socks, gym shoes or trainers, sandals, towels, soaps and deodorants as well as pedometers and even training gear like skipping ropes or gym passes and equipment access keys, mobile phones, power banks, keys and even wallets. The varied amount of kit you can put into a gym big shows why this can be such a useful item to use in promotional campaigns and especially those aimed at health and wellness. Another thing to think about could be duffel bag size. Most lockers in a gym will only be able to hold a certain size. The same is true for aircraft overhead cabins which generally limit bag sizes. Whilst duffel bags may be considered unisex it can be worth considering different styles, sizes and colours for different market segments and demographic groups. It is always difficult to recommend a promotional duffle bag size as people have different requirements. The best way to approach this is in terms of the amount of internal space the bag offers. A typical 30litre bag will provide enough space for an overnight change of clothes or trip to the gym. 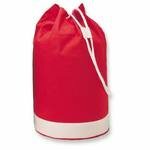 Larger sizes are available up to 90litres which can be larger enough for cover a couple of weeks away from home and provide alternative solution to a rucksack or backpack. Other things to consider are whether you need internal or external pockets and whether these need to be secured using Velcro or zips. For promotional purposes we always recommend working to your budget, branding and needs of the client or recipient base. School students may have different needs from a duffle bag compared to sports people or business travels. For each of the bags shown we provide a total size which can be used as a guide. If you cannot find the promotional duffle bag you need or want more assistance, please call us on 0800 158 3080. We can source further duffle bags from our supply chain and offer a fully bespoke design and manufacturing service for large quantity runs allow you to fully customise your bag. Can the bags be cleaned? If there are marks through every day usage we suggest a wet sponge is applied with a mild soapy water. This is very much dependent on the material and stain type. We always recommend testing an area first. This is one reason why people choose darker coloured materials for the bags over lighter colours or white canvas. What’s the leadtime for a bespoke design? All delivery times are quoted from artwork sign-off. For a custom or bespoke design we can typically be looking at 6-8 weeks or more. A lot depends on whether we are designing a bag from scratch and whether we can manufacture or need to factor in shipping times from an overseas factory. Do you recommend a screen print or embroidered logo? The option depends on the material the bag is made from. For durability we always recommended an embroidered logo as this will be the most hard wearing but the imprint size will generally be smaller to reduce costs. For impact a screen print over the whole imprint area will have the most impact.